Today we shall explore our mystic skills to try to divine the future. 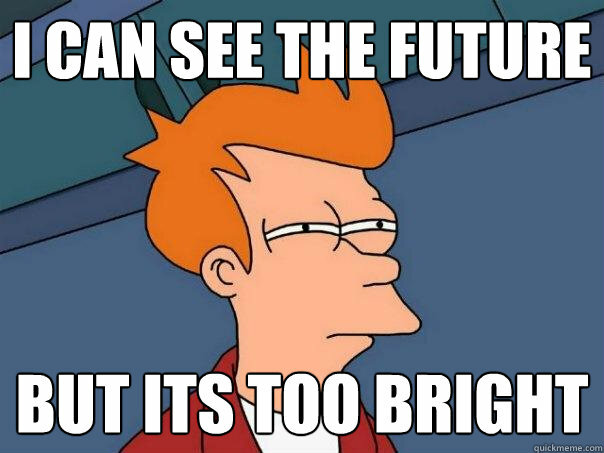 To do so, we will use the type Future that Scala is giving us. Wait, wait, what is the type Future? Scala’s Future type is used to compute heavy operations in background so that the main execution thread remains unblocked. Within that Future, one or several operations will be evaluated. To do so, a parallel thread will be started. def getFirstMillionOfPrimes: List[Int] = ??? In a blocking way: blocking the execution until the future is completed. In a non blocking way: registering a function that will be executed once the future is completed. What has been traditionally known as a callback. Let’s see how this would be implemented. One of the options we had was to perform a blocking call on the future. This blocking call will wait until the future is completed and when so, it will return its result. As can be appreciated, a timeout must be defined so that the wait is not indefinitely long. In case the Future exceeds this timeout when computing the result, a timeout exception will be thrown. This way of getting the result is not recommended since by blocking the program execution, what we are doing is just what we are trying to avoid by using the type Future. However, this is used sometimes, for example, in testing. So, how should we work with Futures then? Easy, with callbacks. Callbacks will allow us to perform one or several actions once the future is solved. But here’s the magic, they will do so in a non blocking way. The callback just has to be defined and then it will be called transparently when the future is completed. In the meantime, the program will continue with its execution. If the future can perform its duty successfully, the result will be returned encapsulated in a Success type. On the contrary, if something goes wrong, the generated exception will be returned encapsulated in a Failure type. In this case, we are waiting until the future we had previously defined is completed and then, we print its result. As we have seen, that result will be encapsulated in a Try type. Besides, we can define callbacks that will be only executed if the future goes right or wrong.